GamePlan is a visual, intuitive Gantt chart and project management software for teams and individuals in any industry, including manufacturing, consulting, technology, construction, and marketing. The software, which is suitable for long term projects or companies managing multiple projects at a time, creates color-coded Gantt charts which serve as visual plans of action. Resource-leveled project scheduling is provided through a visual whiteboard user experience. Users plan their project by drawing out their project workflow on the GamePlan virtual whiteboard, and as they plan, the project schedule automatically updates and is displayed in a Gantt chart. This helps to eliminate mistakes and ensure that all stakeholders understand the visual plan. GamePlan's Gantt charts display entire resource-leveled project schedules and allow effective project tracking and goal setting, based on what's achievable with a team’s availability, while GamePlan's scheduling engine automatically calculates an achievable project timeline, for sharing with teammates and clients. Good tool with unique feature and very prompt and responsive support.I was looking for quite some time for a tool that would really make my life easier during the project planning phase. There are many tools out there with many nice features, however, as for the planning phase, they all miss out. You can create WBS, you can plan in Gantt, do a a network diagram, but all these methods are, from my experience, very non-intuitive, hard to read, and thus hard to get buy-in of the stakeholders. In this GamePlan I finally found what I was looking for, at least for the planning part. The visual planning is very intuitive and straightforward, which - coming from real-life experience - significantly helps all stakeholders to understand which activities are needed, their dependencies, complexities, and helps to reveal activities which might have been forgotten. The nice thing is that you can actually use the functionality for mind-mapping, too, and then transform it to activities flow (a project network diagram, actually, just much more easy to read and understand). The automatic transformation of the diagram to Gantt chart is awesome as well. So you can provide traditional view on the project plan to all those who require it. And you can export the data into Excel and play with it further, e.g. use it as input for Office Timeline. I was looking for quite some time for a tool that would really make my life easier during the project planning phase. There are many tools out there with many nice features, however, as for the planning phase, they all miss out. You can create WBS, you can plan in Gantt, do a a network diagram, but all these methods are, from my experience, very non-intuitive, hard to read, and thus hard to get buy-in of the stakeholders. In this GamePlan I finally found what I was looking for, at least for the planning part. The visual planning is very intuitive and straightforward, which - coming from real-life experience - significantly helps all stakeholders to understand which activities are needed, their dependencies, complexities, and helps to reveal activities which might have been forgotten. The nice thing is that you can actually use the functionality for mind-mapping, too, and then transform it to activities flow (a project network diagram, actually, just much more easy to read and understand). The automatic transformation of the diagram to Gantt chart is awesome as well. So you can provide traditional view on the project plan to all those who require it. And you can export the data into Excel and play with it further, e.g. use it as input for Office Timeline. The tool is still a little bit hard to use for tracking of activities progress and related team management. But the development team is very responsive to customers' feedback and they are developing the product continuously, addressing all the relevant inputs and requests they get. That is at least my experience from the past few months of my usage of the software. The software is completely logical. The key for me was to learn the underlying rules written into the software. It quickly became intuitive and, frankly, it's like having a superpower to be able to project the complex contents of my brain out onto a whiteboard, and have so many schedules tracked so that I've been able to focus on other things, and not worry about forgetting important elements of a plan. The software keeps projects on track, but also provides team leaders with an excellent method of communicating the relative engagement and efficiency of human resources. The automatically-generated Gantt Charts provide excellent communication tools and the whiteboard is intuitive to use. Most importantly, perhaps, the software shows what is actually achievable. This is where GamePlan excels: it takes into account complex schedules and available resources to accurately project what deadlines can or cannot be met. The software keeps projects on track, but also provides team leaders with an excellent method of communicating the relative engagement and efficiency of human resources. The automatically-generated Gantt Charts provide excellent communication tools and the whiteboard is intuitive to use. Most importantly, perhaps, the software shows what is actually achievable. This is where GamePlan excels: it takes into account complex schedules and available resources to accurately project what deadlines can or cannot be met. I would have preferred a longer trial period. Fantastic application for aiding in project management and auto scheduling. They are keen on providing an excellent user experience.- Ease of use. Can very quickly plan out a project or production schedule. - Customer support is excellent. - keen on improving the product. - Worth the cost. - Ease of use. Can very quickly plan out a project or production schedule. - Customer support is excellent. - keen on improving the product. - Worth the cost. No real cons. The one con was adressed with the latest enhancments. GamePlan makes my life so much easier. It allows me to schedule out my books and projects so that I always know if I'm going to meet a deadline... and if I'm going to miss it, by how much. It's a cleverly designed tool that makes me feel calmer and more in control of my business, projects, and deadlines. I'm super grateful this exists. It took me a few minutes to get used to the user interface, but once I did, it became intuitive. They have good tutorials and solid support, so I was able to get the hang of it pretty quickly. *Savings are available on annual subscriptions. • GamePlan is a project planning software for businesses of all sizes, with one or multiple time-sensitive projects running at a time. The software is also suitable for use by individuals running long-term projects which require a plan of action and timeline. 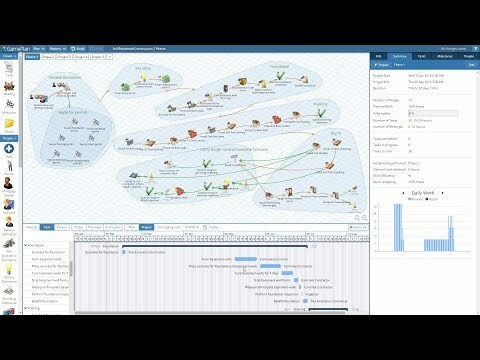 • Users can draw out a project workflow on GamePlan's virtual whiteboard, and the software's powerful scheduling engine turns it into a visual Gantt chart. • GamePlan produces a daily agenda for each team member to follow, providing everyone with a clear direction, list of tasks, and task deadlines. • Any changes made to a project workflow by users on the virtual whiteboard are automatically reflected on the project schedule and Gantt chart. • The software estimates project delivery dates and shows all possible reasons that could result in the delay of a project's delivery. Below are some frequently asked questions for GamePlan. Q. What type of pricing plans does GamePlan offer? Q. Who are the typical users of GamePlan? Q. What languages does GamePlan support? Q. Does GamePlan support mobile devices? Q. Does GamePlan offer an API? No, GamePlan does not have an API available. Q. What other apps does GamePlan integrate with? Q. What level of support does GamePlan offer?